Like any good Jewish Montreal boy, one of my most important literary influences is Mordecai Richler. Although I began writing poetry and lyrics in high school, it took many years before I could ever imagine myself as a writer. During those formative years I remember studying the dust jacket of one of his novels (it may have been Solomon Gursky Was Here, my personal favorite of the Richler canon). On the back was a photo of the author sitting at his desk, presumably in the Eastern Townships, for through the window there was a clear view of trees. At that moment I had an epiphany: wherever the writing life (if I was indeed to have one) would take me, my ideal creative environment would be rural and surrounded by many trees. Although most of my adult life has been spent in one noisy concrete jungle or another (28 years in Montreal and another 17 in Toronto, with brief stints in Glasgow and LA), I eventually found my true creative home when, in 2001, I moved to Prince Edward Island at the ripe old age of 45. Here I write full time, surrounded by 22 acres of wooded land and a few feet away from the shores of Foxley River. Like anybody who was not born on PEI, I will never be considered an "Islander" because I am "from away". There are those (certain newcomers and some Islanders too) who consider that term insulting. I am not one of them. If anything, being "from away" has helped define my creative identity, which is apropos, since I moved here with the single-minded purpose of focusing on my writing. During the past ten years I have had fiction and poetry published in numerous magazines, produced an award winning collection of stories, written a novel (which I am still shopping) and ventured out of my comfort zone by writing for radio, stage and film. Recently I was described on radio (1) as being a "new voice" on PEI, which is certainly true in the sense of my emerging writer status, but also because of my unique take on Island life. The example cited was my story, The Two Annes, where a young artist has a vision of Anne Shirley (she of Green Gables fame) and Anne Frank sitting together at a café. An odd pairing, to be sure, but both connected by being outsiders, or as the young artist sees them: "his two misfit Annes." Not unlike those two icons of otherness, I often feel most at home being "from away" and I believe it is the natural vantage point of all writers. I suppose that is why many writers feel the need to leave home so that they may conjure it more clearly and with greater authority on the page. Even when Mordecai Richler returned to Quebec to write about life in Montreal, he still chose the cooling shade of those trees in the Eastern Townships. In the beginning stage of working on a story I always feel that I am on the outside looking in, trying to get the lay of the land, so to speak, and seeking clues, from which I can understand its inhabitants. As the subject of a profile on a friend's blog (2), conducted in the form of a Q&A, I was asked for a favorite passage from any book. Quoting another major influence, Kurt Vonnegut Jr., from his seminal novel, Slaughterhouse-Five, I chose: "Listen: Billy Pilgrim has come unstuck in time." I went on to explain how this sentence, describing a much more extreme example of coming "from away", influenced my writing. " The whole idea of coming unstuck in time is a kind of madness where one discovers that linear time as we understand it doesn't exist and everything - past, present and future - is happening all at once. That's what fiction and the writing process is for me: a kind of madness where truth reveals itself, but not in any coherent way, until I begin writing and trying to make some kind of sense of it. I learn things about my characters and the situations they are in (and also about myself and what is important to me) as I slowly organize the events and give shape to the story." As for my daily routine, the only schedule I keep to is that, at some point, I must get something done. I try to write every day and when I am not writing I am doing some kind of research, either related to a project or to publishing in general (i.e. contests, calls for submissions from magazines or publishers, workshop opportunities, etc.). Recently I was involved in a mentoring program with the PEI Writers' Guild, where I counseled a writer who was working on a children's book (her first attempt at creative writing). I've also judged a couple of short story contests. I find endeavors such as these, where I'm casting a critical eye on others' writings, beneficial in as much as I am then forced to look at my own work more objectively. My most productive times of the day are in the afternoon or evening. I am in awe of those writers who wake up in the morning and put in a couple of hours of concentrated productivity. I think I would be able to do that only by necessity and with much self-training, because it would not come naturally. As it is, the waking up process begins with a walk along the quarter mile of dirt lane that leads to the road where I fetch our morning newspapers from the box. It is on this leisurely journey that I silently admire the ever-present spruce and birches. Whichever season they embody - the sweet smelling green of summer, the brilliantly flaming red-orange of autumn, winter's blinding white chandeliers or spring's ripe brown thaw - they are reminders of how fortunate I am to live where I do and to have found the creative home I always suspected existed inside myself. Steven Mayoff was born and raised in Montreal, lived in Toronto for 17 years and has made Foxley River, Prince Edward Island, Canada his home since 2001. 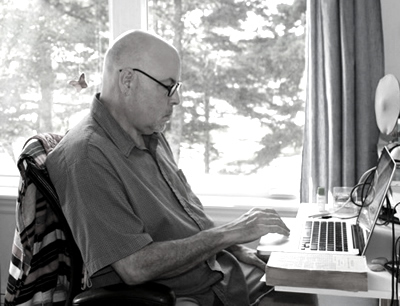 His fiction and poetry have appeared in magazines across Canada and the U.S.A. including Grain, the Malahat Review, Pottersfield Portfolio, the Dalhousie Review, Mobius Magazine, Euphony and the Vocabula Review as well as the Dublin Review and Crannog (Ireland), The Arabesques Review (Algeria) and Upstairs At Duroc (France). He has collaborated on one stage play, Bully, produced at The Theatre Centre in Toronto, and three radio plays - Call Waiting, Afterlife and Phone Booth -- for CBC Radio. In 2000 he was nominated for a Dora Mavor Moore Award for his contribution as a lyricist to the show Swingstep, which was produced at The Ford Centre in North York, Ontario. His one-page screenplay, The Dim Sum of its Parts, was made into a film and has garnered almost 400,000 viewings on Youtube. He has won the David Adams Richards Prize and was a Top 100 Semi-finalist for the Amazon.com Breakout Novel Award. His first fiction collection, Fatted Calf Blues, won a 2010 PEI Book Award, was shortlisted for a 2010 ReLit Award and is currently a Top 5 finalist for the CBC Cross-Country Bookshelf for the Maritimes. A full-length screenplay adaptation of Fatted Calf Blues was a Top 100 Semifinalist in the 2010 Scriptapalooza competition. For more information, visit Steven Mayoff's web site at www.stevenmayoff.ca or his Facebook group.